Una Tiers took a run-in with the law and turned it into a book, uniquely using the experience to relieve stress. Here, she offers numerous marketing suggestions in varying media and explains her take on the publishing industry. Judge vs. Nuts is about a lawyer, a goldfish and a dead judge. It explores Chicago and murder. It will make you laugh. I think you will like my characters, puns and self-effacing remarks. Honestly, a judge tried to arrest me and I eliminated my stress by murdering him (on paper). Occasionally I added to the details, adding more victims as warranted. Pretty soon I discovered mysteries outside of Sherlock Holmes and the result was Judge vs. Nuts. Book signings became a hobby and I learned something at each one. 3. What is your opinion of the future of publishing? Self-publishing has clearly rocked the publishing industry to its foundation. It presents many opportunities for new authors. My Kindle is packed with new authors and those without big exposure and I love what I am reading. It isn’t pushed into what the big houses feel will sell. E-books are here to stay, without a question. I think they will exist companionably with print books. The combination of e-books and self-publishing opportunities is also changing the publishing world and making it attainable to make your dream of writing a book come true. At the Chicago Tribune book festival last year, e-books were almost ignored. People toted around huge bags of paper books. I don’t expect that to change but what an opportunity we have with the electronic options. LinkedIn, Facebook, Goodreads, business cards (resembling an attorney card), bookmarks, guest blogging and talking to other writers and to readers. I made press releases that are still going out, I put an article on several local online newspapers like Evanston Patch and Triblocal. My book trailer is on YouTube and on NewsClipTV. I put it on my website and on my Amazon author page. I put up flyers in coffee houses and plan to put samples in the reading bins. Of course, looking for reviews and guest blogging are part of the plan. Judge vs. Lake Michigan is in a rough draft. My writing is stronger with less back story and a faster pace. Although they don’t survive the book, my new characters are nice people. 6. What would your overall brand of writing be described as? Brand and goals seem the same to me. My goal is to make people laugh while educating them a little. I would like them to see lawyers as people and not sharks. Would that encourage people to do more work with lawyers? I hope it would. 7. How can readers learn more about Judge vs. Nuts? Come over to my website. If you send me an email request (una@unatiers.com) I will send you a part of the book. I’m also on LinkedIn, Facebook and Goodreads where you are welcome to join me. Judge vs. Nuts is available at all the major e-bookstores, like Amazon and Barnes & Noble. Most importantly, if you have a chance to read Judge vs. Nuts, drop me a line, write a review, make suggestions. Maybe you can be a character in the next book. Thank you Kris for inviting me, the questions were great and I enjoyed myself. Una, your answers are very interesting. I’d love to hear more about why the judge tried to arrest you. And your promotional efforts are awesome! That’s the way to do it. 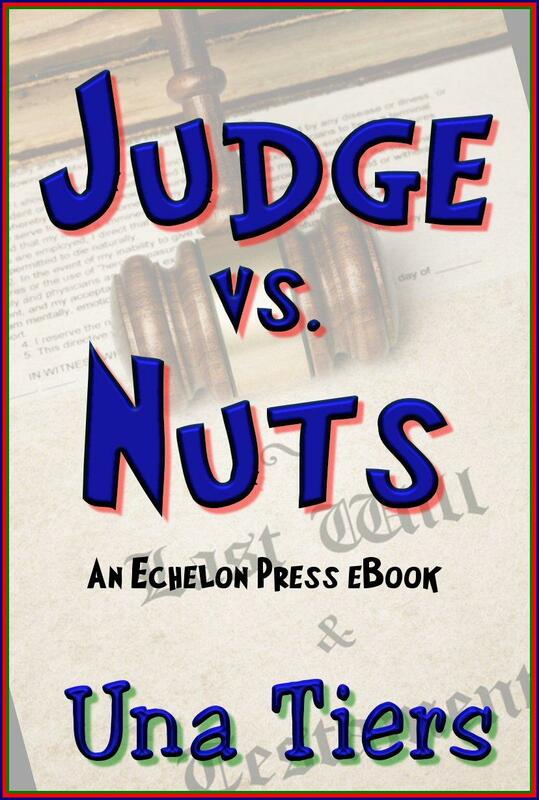 I’ve read Judge vs Nuts. It often made me laugh out loud. Your wit and humor come through beautifully, and the story is good. Not conventional fare. I loved it. It was a terrible misunderstanding caused by lies of opposing counsel. My other goal in writing is to have lawyers seem more human, to the degree that is possible. Perhaps they will come in and plan more, where we can do more for them. thanks Ellis. Thanks for the opportunity to share some of the marketing. Authors helping authors is such a large component of the marketing. Thanks Jakes. What are your favorite marketing tasks?